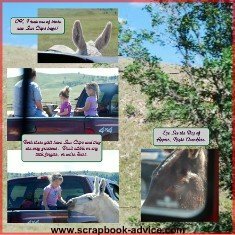 To start off the Custer Statepark Scrapbook, the first layouts we show are from the "Donkey Jam" we ran into on our way to visit Mount Rushmore. 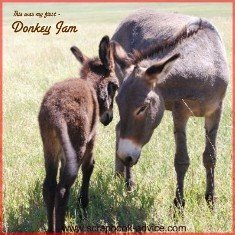 This was my first Donkey Jam, although I had been through several "Bear Jam's" during my growing up years when we used to visit Yellowstone National Park. All of these pages for my Road Trip Scrapbook were done digitally through the Heritage Makers system that can be reached through my consultant page at MemoryBookArchitects.com at Heritage Makers. Scrapbook Advice Tip: With Digital Scrapbooking, I like the option to use some of my better photos or landscape photos as actual background papers (I drag the corners to enlarge them to 12 x 12 inches) and then to incorporate related photos in the blank areas. 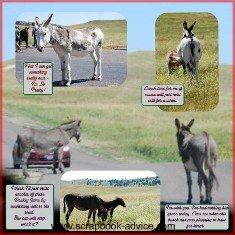 I have done that with all of these "Donkey Jam" pages. There will be others in the Yellowstone Park Scrapbook from our encounters with Buffalo. 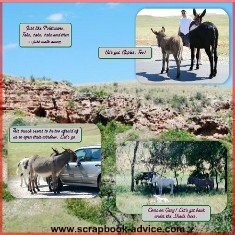 The Custer Statepark Scrapbook Layout on the left is just the one photo enlarged to 12 x 12 inches with no other photos or embellishments, just the journaling in the upper left side that says "This is my first Donkey Jam." The Heritage Makers Digital Scrapbook System allows for journaling in various fonts styles, colors (in this case dark brown) and sizes. The Layout on the right uses another photo enlarged to 12 x 12, but also has 3 other regular size photos layered over what was just the grass in the field of the larger photo with captions added in the same color and font of the left page. 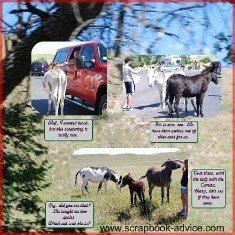 For these two Custer Statepark Scrapbook Layouts, I again enlarged the photos for the background to 12 x 12. I used a lot of journaling and captioning, this time I put boxes around the journaling in a green. The placement of the journaling was near the photos or in some cases, layered over the photos. I tried something even move extreme on these two layouts. I dragged the background photo large enough to span both layouts - to 25 inches wide. I have a 10.2 megapixel camera so I think that had something to do with the fact that most of these enlarged photos are pretty clear, but I was experimenting to learn the Digital Scrapbooking system from Heritage Makers. I could have added frames or mattes around these photos in any width or color, just like the journaling boxes, but I chose not to. These Donkeys really made our day. 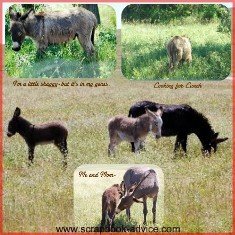 They were fun to watch and feed and everyone, young and old, seemed to enjoy getting held up in their playful "Donkey Jam." Hope you enjoyed these. More to come a little later from the Road Trip Scrapbook. Meanwhile, check out some more stops on our Trip below. from the Custer Statepark Scrapbook page.